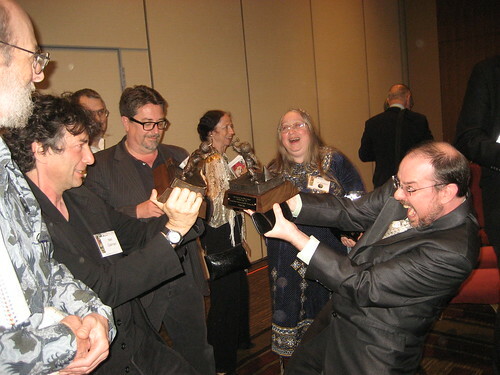 Bradbury Award winner Neil Gaiman and I use the award statues to fight to the death. Photo credit: Charishawk (click on photo for a Nebula Awards photoset). As I think most of you know, I flew in to the DC area last Wednesday to take part in SFWA’s Nebula Awards Weekend, not only because was going to be an awesome time with awesome people, but because I am president of the organization, so me not showing up to the thing would be, you know, tremendously bad form. Here’s what went down. First, as I noted earlier, I left my travel bag in my car, which unfortunately contained my Mac Air, several books, my car key, and a bunch of cables relating to electronics. This annoyed me terribly. Contacted several cab companies and the DC cab commission to locate it. The good news, such as it is, is that the Mac Air is lockable and trackable from the moment anyone tries to access the Internet with it, so I locked it and will have it post a note asking to be returned. Also, almost everything I had on the computer was also redundantly stored elsewhere, so I have lost no work. Finally, the thing is insured. The bad news: It’s still not returned. I am going to have to work on the assumption that the bag and its contents will continue to go missing, especially since I am leaving the area tomorrow morning. Other than that the weekend was fantastic. I was pretty busy, with two board meetings and a SFWA business meeting, both of which will be of limited interest to people who are not SFWA members but which were very productive and useful. Go us. I also participated in a panel on humor in science fiction and fantasy, which also included James Patrick Kelly, James Morrow and SFWA’s newest Grandmaster, Connie Willis. I thought it went very well, personally; between the four of us we covered a lot of ground in the subject. I also participated in our mass author signing, sitting between Nebula nominees Carolyn Ives Gilman and Mary Robinette Kowal; I signed a fair number of books, which makes me happy. The big event of the Nebula Awards weekend, not entirely surprisingly, are the Nebula Awards themselves, which this year had Walter Jon Williams as MC (he did a great job), astronaut Mike Fincke as our keynote speaker (he was very inspiring), and of course Connie Willis as Grandmaster (immensely charming and heartfelt). And we gave away some prizes too. And then there was the after party, in which everyone poured into the SFWA hospitality suite and ate and drank and talked very loudly about things until it was time to go to sleep. I really love the Nebula Weekends because in a sense, as SFWA president, it’s my party — I get to host some of of the most interesting writers in the world and celebrate their achievements. But it would be horribly, horribly wrong for me to take any of the credit for the success of the weekend. That properly goes to Peggy Rae Sapienza, in her role of Nebula Weekend event co-ordinator, Steven Silver, and a huge raft of volunteers who have put time and energy into the event. I got thanked by people for the weekend, but I’m not foolish enough to take the credit. That goes to the people who made it work. At the moment I’m pleasantly dazed from everything and since I have an ungodly early flight tomorrow, I’m likely to crash early tonight. But to everyone who came to the Nebula Awards Weekend and made it wonderful: Thank you. 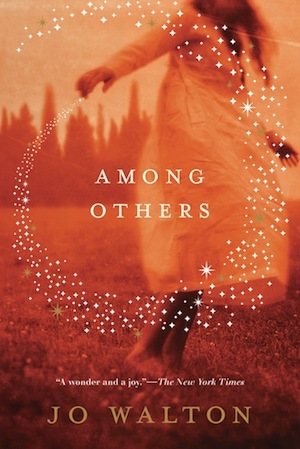 The Science Fiction and Fantasy Writers of America, of which I am the president, gave out its Nebula and other awards last night. Here’s what won, by whom, and who published it.